*Dale Chihuly Inspired Sculpture *- My Mini Modern Artists took a look at the work of Amercian glass sculptor, Dale Chihuly. Jackson Pollock Pumpkin Painting Art Project- Jackson Pollock and Abstract Expressionism? My children and I used an actual pumpkin, but a synthetic one from the craft store would be a nice keepsake. This is a messy project, but that’s part of the fun. This could EASILY be done with a glass or ceramic ornament! *Matisse Christmas Trees *4th-6th Grade -Would make a gorgeous Christmas Card! Get inspired by the impasto technique used by Vincent van Gogh to make this sculptural keepsake! Students roll Model Magic® coils to cover a foam ball in the style of a great masterpiece. Matisse Inspired Christmas Ornaments-One of my favorite paintings and some simple salt dough hearts-acrylic ornaments. Presenting a print made from an original hand-carved, linocut.This beautiful Pablo Picasso print is titled "Dove of Peace"Print size: 11 x 8.5 inches. Bring Art History to Your Holidays! Looking for a fun way to tie art history into you holiday season, whether at home or in a school setting? 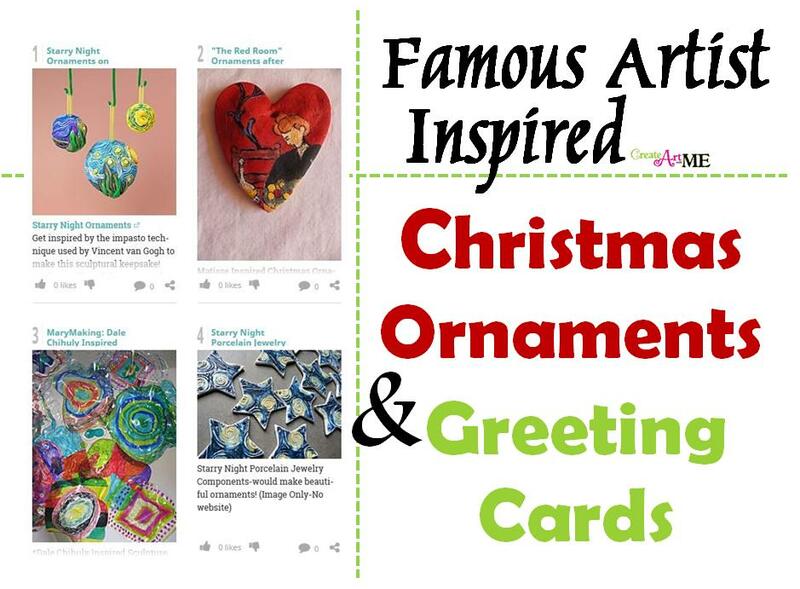 Check out these beautifully created ornaments and greeting cards (and ideas for these) that have been inspired by master artists such as Monet, Van Gogh, Matisse, Chihuly, Pollock & Picasso. Click on the link to see the inspiration! Dale Chihuly Inspired Sculpture -great ornament idea out of plastic cups! These would be beautiful with Christmas lights shining through them! Starry Night Porcelain Jewelry Components– great ornament idea in ceramics! Jackson Pollock Pumpkin Painting Art Project– Easily do this with plastic balls for ornaments! If you choose to use or share any of this post, please link back to my blog Create Art with ME!